Everyone's favourite fantasy drama series, Game of Thrones, has people on the edge of their seats with its latest season. What with the Stark kids reuniting and the dragons finally showing their fire-breathing skills six seasons in the making, it is safe to say that season 7 of Game of Thrones so far has been one suspense-filled ride. But that doesn't mean fans have lost their humour. 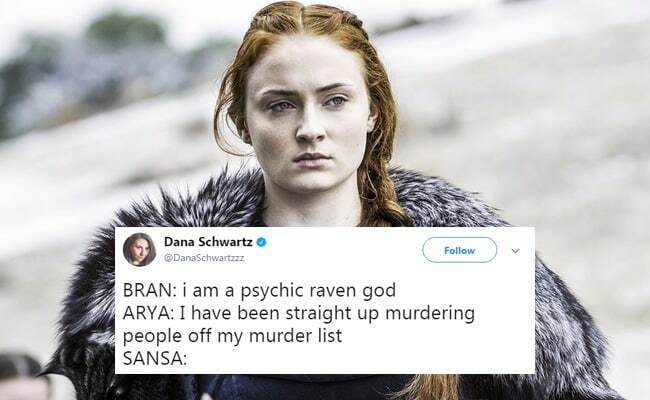 As the Game of Thrones fever has hit the world again, we decide to compile the 15 funniest tweets that will make every GoT fan laugh out loud. Sansa: "We have to make sure we have enough grain"
Bran, Arya and Sansa all at Winterfell. "He's a philosophy major now." Meera: my brother died for you, Hodor and Summer died for you, I almost died for you.